The ongoing violence in South Sudan has had an unbearable humanitarian cost. Currently, more than 1.4 million South Sudanese are internally displaced and the UN estimates that $1.8 billion in humanitarian aid is needed in 2014. As one of the most important investors in the previously unified Sudan and now in the independent South Sudan, China has displayed what is by its standards unprecedented diplomatic activism to support the peace talks in Addis Ababa, mainly through its contribution to the United Nations Mission in South Sudan and active mediation efforts. 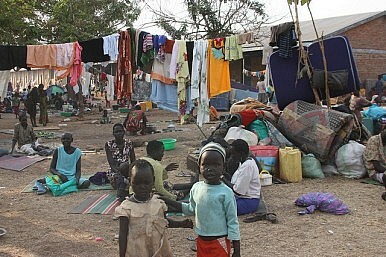 However, the emergency relief it has extended to Juba amid the conflict has received far less attention. Beijing provided the first emergency aid of $100,000 through the Chinese Red Cross on December 27, 2013. Since then, there have been four major announcements of emergency relief. On January 23, 2014, Chinese Ambassador to South Sudan Ma Qiang signed an economic and technical cooperation agreement with Juba and promised $3 million in humanitarian aid. Cash aid of $200,000 was also offered during the signing ceremony. In April 2014, Beijing announced the donation of about $8 million in food and medical assistance when South Sudanese Foreign Minister Barnaba Marial Benjamin exchanged views on the security situation in a telephone conversation with Chinese Commerce Minister Gao Hucheng, who heads China’s principal institution in charge of foreign aid. In mid-April, Ma claimed that China had donated $8.5 million in humanitarian assistance. This statement confirms that China’s aid commitments by then primarily comprised the two tranches of aid announced in January and April. Beijing’s third major announcement of aid came during Li Keqiang’s visit to the African Union’s headquarters in Ethiopia on May 5. He pledged a further $8 million in emergency relief. Most recently, South Sudan’s Vice President James Wani Igga secured from Beijing a commitment of over $3 million in humanitarian materials, $1.5 million in medical assistance and a grant of $24 million. All in all, China appears to have pledged emergency relief worth of at least $21 million. The figure could reach $45 million, depending on whether the $24 million grant will be used as part of China’s emergency relief efforts. However, while this grant could certainly be counted as part of China’s foreign assistance to South Sudan, it is more likely to primarily finance agriculture and infrastructure projects that go beyond the scope of short-term humanitarian relief. Clearly, Beijing is making a contribution to the ongoing humanitarian operations in South Sudan, but its efforts are still dwarfed by many traditional donors, in particular the Troika (a coalition of the U.S., U.K. and Norway). By early October, the U.S. as the largest donor to South Sudan, has committed $720 million in emergency relief. Britain has given about $206 million of aid and Norway had pledged about $80 million by late May. Only by taking the highest estimate would China’s commitment to emergency relief be similar to that of Japan ($42 million), although it seems likely that it outweighs commitments from Switzerland ($19 million) and Holland ($12.5 million), and is undoubtedly greater than that of many other emerging donors, such as Qatar, Turkey, South Korea, India and Brazil. To date, China’s emergency relief has been warmly received in South Sudan, not only because it contributes to alleviating the disastrous humanitarian situation, but also because of its “no-political-strings-attached” approach. Some European countries and the United States, although having not made public announcements, are reported to have slashed direct aid with the South Sudanese government. Most recently, the Netherlands has decided to halt direct cooperation with the ruling government and suspended activities of about €2.5 million ($3.2 million), due to frustration over the continuing violence, impunity, and several cases of violation of human rights. However, China’s approach to aid means that a similar scenario is unlikely to occur with its commitments. Until now, its distribution of humanitarian assistance appears to have been predominantly channeled in cooperation with the South Sudanese government. China has not contributed to the OCHA-led 2014 Crisis Response Plan to South Sudan, which requests $1.8 billion to carry out urgent humanitarian interventions this year. But China reportedly has paid $3 million to support to IGAD-led peace process. Compared to the traditional players in South Sudan like the Troika, China’s profile in distributing emergency relief remains in line with its role in the IGAD-led mediation process – noticeable yet limited. Beijing’s generosity combines with its contribution to the peacekeeping mission and the peace talks as important efforts to protect its overseas interests in South Sudan – notably the security of its investments and nationals there. This is illustrated by the phone exchange that Commerce Minister Gao Hucheng had with South Sudan’s foreign minister. While promising further assistance, Gao succinctly expressed the wish that South Sudan “could take forceful measures to protect the safety of lives and properties of Chinese people and enterprises, and render more facilitation and guarantee for business production and operation, material transportation and personnel entry and exit. Zhou Hang is a Beijing-based researcher with the China and Global Security Project at Stockholm International Peace Research Institute. His research currently focuses on China-Africa relations and China’s foreign aid.